Effective piano practice is at the core of learning to play piano. Here you will find tried and tested practice ideas and strategies that are great for beginner (and more advanced) pianists. Learn How to Practice More Effectively. Got a Great Piano Practice Tip? Share it Here! “Now go home and practice”. (Right....) Ever heard that expression? So annoying. You just want to know: OK, how exactly? Some people have the ability to practice and get great results without having learned much about how to practice, that is true. But most people don’t. Actually, I didn't start learning proper piano practice techniques myself until I started teaching piano. And after more than 30 years of teaching piano, I constantly see how it's absolutely essential for all piano students to learn about effective practice routines and how to practice as early as possible. But still I notice that practicing the piano is somehow assumed to just work by itself, as if every piano student was born with a “how to know how to practice” gene... Not true! So, here are practical tips and exercises on how to practice with more efficiency and how to get better results from each session! I can recommend: The Musicians Way, it's a book crammed with great tips and plans on how to organize your practice. It has inspired me and my teaching a lot. Here is an easy but thorough way to structure your piano practice. By taking a piece through 6 levels of practice, you will build security and learn the piece from bottom up. 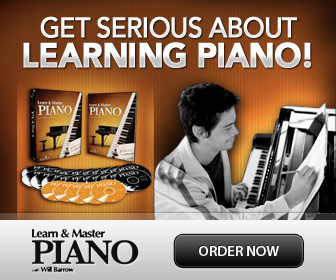 >>>Go to "Piano Practice Tips for Beginners: 6 Level Plan". Divide and conquer! Here you will learn effective techniques for getting through that first stage of learning the notes of a piece. >>>Go to: Piano Practice Techniques for Beginners. To practice piano with good results, it is a good idea to learn more how our analytical understanding of the music and our body movements are coordinated by our brain... It may not necessarily work in the way we'd expect! Developing an effective piano practice routine doesn't only save time, but also helps you have more fun and enjoy you practice. Interleaved practice seems (and is) random, and random is not efficient...or perhaps it is? The time needed to practice and making good progress varies greatly with each individual. It's a fact that a certain number of practice hours are required to reach any skill level, and to reach a good level of piano playing- you need to put in the time! But how much do you need to practice? A metronome is one of the few gadgets a pianist really needs. For effective piano practice it's really essential. Learn how to use a metronome for different aspects of piano practice here. Memorization is not really necessary to play and perform piano pieces, but it has become an almost standard requirement for pianists. And having memorized a few pieces means you always have them "at hand" ready to be played. Learn more how to memorize sheet music here. Are you suffering from stage fright? Don't let that stop you from performing! As in everything, preparation is key. Read my top tips on how to deal with performance preparation and how to manage stage fright. >>>Go to 10 tips to overcoming stage fright. I have created a piano practice chart for adults here with all the steps you need for an organized practice session! Give it a try and let me know if this piano practice plan worked for you!